The final resting place of Fr. Paul Costello in the church grounds at Leenane Church, Connemara. Fr. Paul Costello was a native of Aughamore. He was son of Joseph M & Mrs Margaret J Costello. 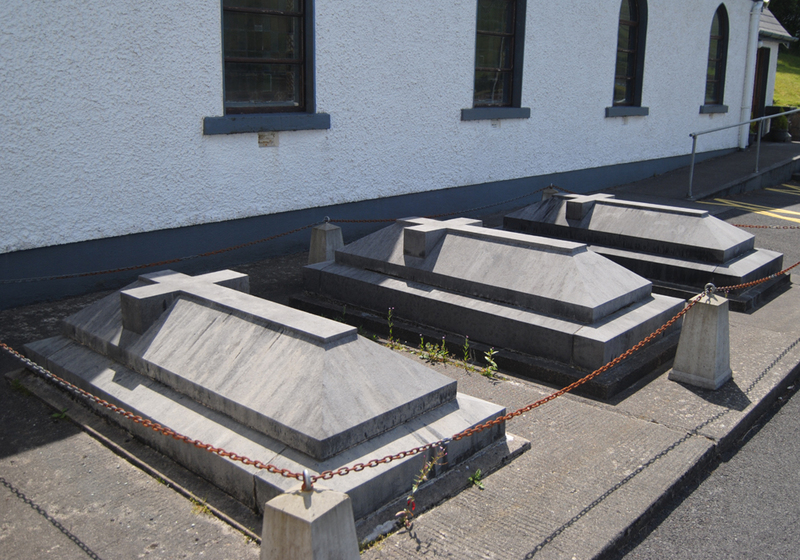 His father was a representative for D&E Williams of Tullamore. He had two brothers, T.V. Costello and W.P Costello. He was born in 1914 and ordained in June 1940. His first appointment was as C.C. in Gort, Co. Galway and he was appointed as A.P. to Menlough in 1944 on the death of Fr. Nicholson. It was often the practise of Archbishop Walsh to appoint assistant priests to parishes instead of parish priests. This meant that the Archbishop was then the P.P. of that parish and the priests ministering there were curates. It also entitled the Archbishop to the privileges of a parish priest in such a parish. He then moved to Cornamona as C.C. His father passed away on February 23rd. 1954. In 1954 he was ministering as C.C. in Clonbur and had moved on as C.C. in Headford by 1957. He was appointed as C.C. to Ballyconeely in August 1961 just after his mother passed away on June 4th. of that year and in 1967 there is mention of him being C.C. in Clifden. In July 1971 he was transferred to Athenry as C.C. During his time in Athenry there are many newspaper reports of his achievements on the golf course. In August 1975 he was appointed as P.P. of Leenane where he ministered until his death on October 25th. 1989 at the age of 75. He is laid to rest in the church grounds in Leenane. His name appears again in the Irish Press of July 23rd. 1992 in a list of people “who owed substantial sums of money to the Revenue Commissioners”. The amount due was £41,519.00 and settlement fees of £26,604.00 took the total due to £68,123.00. His name in the paper appears as Rev. Walter Paul Costello. Fr Paul Costello was my uncle. The outstanding debts to the Revenue Commissioners were resolved by his Executors.